Our first intuitive nudges come from the body, not the mind or spirit. You may experience a gut feeling or a twinge in your eye when considering your next big decision. The more attuned you become to your body’s subtle language of intuition, the sooner you can begin to follow the guidance of your higher self. We are an action-oriented culture. Go, Do, Achieve. We want to achieve and achieve quickly. We ask the advice of experts rather than taking the time to go within and listen. Advice is great but only if you work it through your own truth filter. We must honor our individuality. Only you know what is best for you. 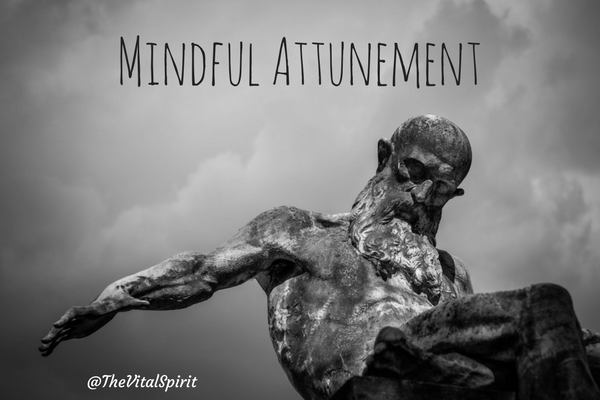 Mindful attunement means seeking your answers within then acting on them. Get quiet, ponder your question or area of concern, and then meditate. Look for the signs, listen to your inner voice. The soul always speaks when we get quiet enough to hear it. Embrace your unique spirit. Nurture that spirit. Honor it by being true to yourself, no matter what the world thinks.